Ideal for growing a variety of plants and vegetables, the Vitopod is a great investment and there are so many happy customers up and down the country, why not become one of them. 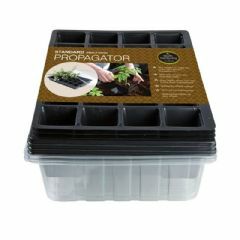 Please refer to our Vitopod Heated Propagator instruction sheet for more information. 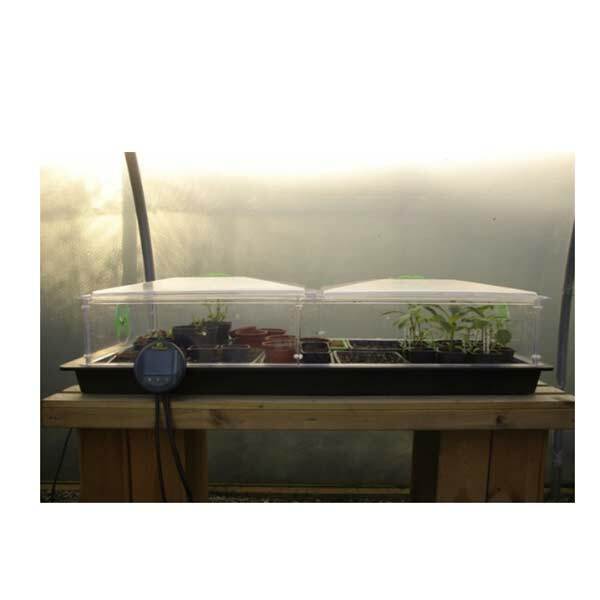 The heated Vitopod propagator has a range of 5ºC to 30ºC. 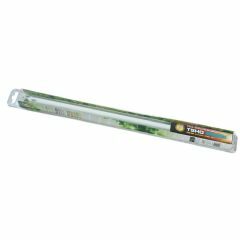 This means you can set the temperature up to 30ºC, ideal for exotics, and as low as 5ºC for overwintering – and of course, any 1ºC temperature in-between. 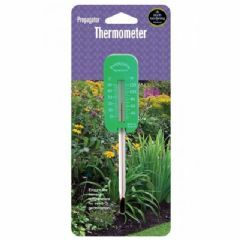 The digital thermostat displays the set and achieved temperatures so you can be confident that your plants receive the exact level of warmth they need. The Vitopod also has large butterfly vents in the lid and sides. These vents provide greater control over humidity and help create a perfect growing environment. Propagate, harden off and protect plants through the winter – the Vitopod does all three! Usefully, it also flat packs away for those rare moments when you’re not using it. 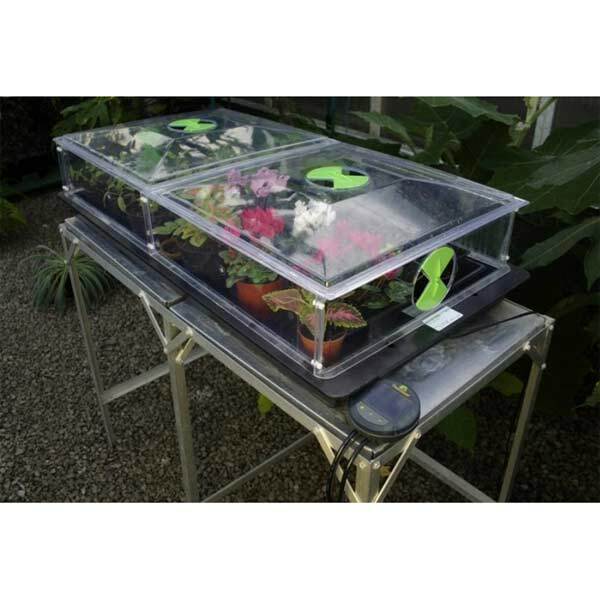 The Vitopod heated propagator delivers heat evenly throughout the Vitopod base so no hot or cold spots, just even growth and root development. The award-winning Vitopod Heated Propagators are the perfect environment for propagating seeds, cuttings and over-wintering plants. Create the perfect growing environment for your seeds and cuttings in a Vitopod heated Propagator, cold frame and mini greenhouse in one. 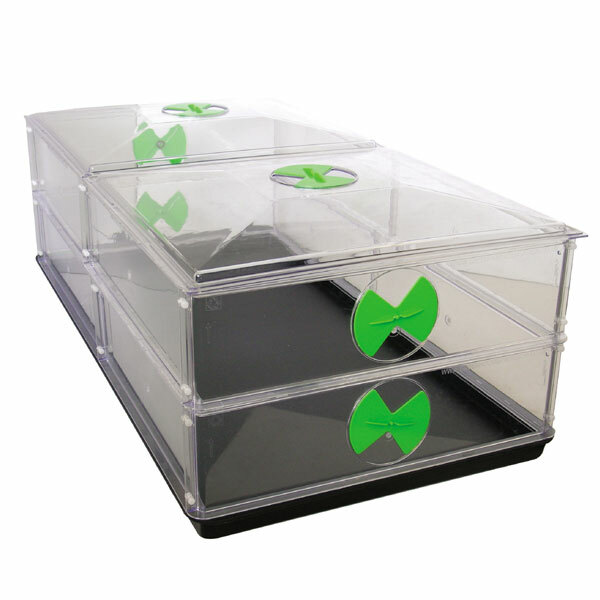 These propagators are resistant to UV deterioration so it won’t yellow and it’s made from a durable, slightly flexible material so that there’s less risk of it breaking should accidents happen. 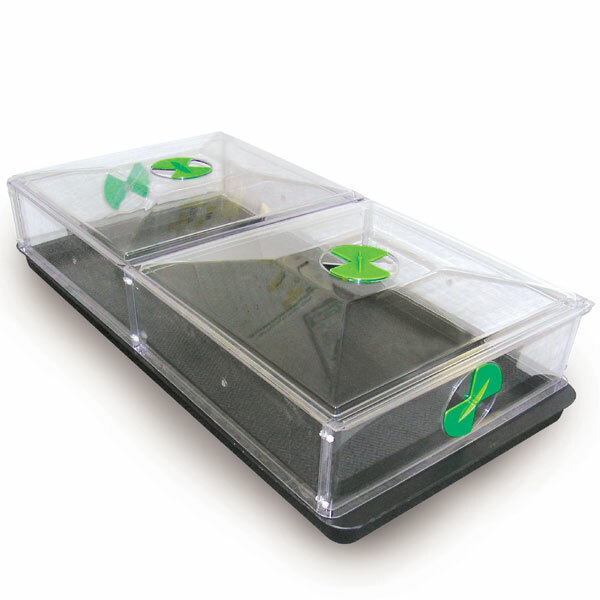 Vitopod heated propagators deliver even heat throughout the base, so there are no hot spots or cold spots and your seeds and cuttings will germinate evenly. 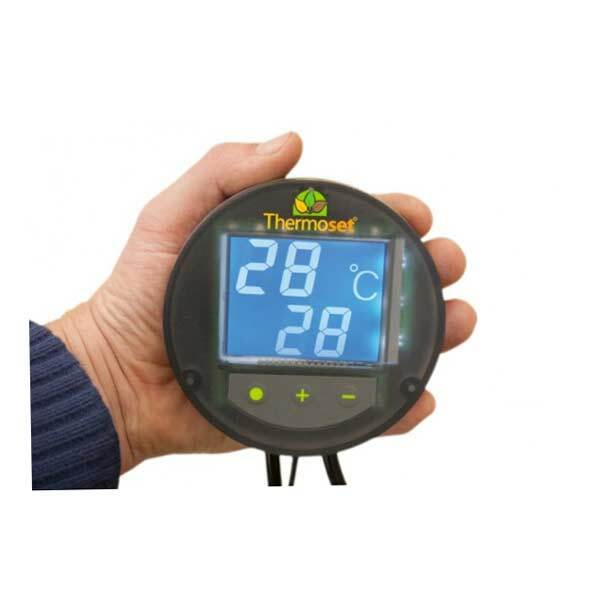 The digital thermostat displays the set and achieved temperatures so you can be confident that your plants receive the exact level of warmth they need. The Vitopods also have large butterfly vents in the lid and sides. These vents provide greater control over humidity and help create a perfect growing environment. Superior humidity control so your plants don’t suffer from damping-off. Ideal for growing a variety of plants and vegetables, the Vitopoda are a great investment and there are so many happy customers up and down the country, why not become one of them. Propagate, harden off and protect plants through the winter – the Vitopods do all three! Usefully, it also flat packs away for those rare moments when not in use. The Vitopod heated propagators deliver heat evenly throughout the Vitopod base so no hot or cold spots, just even growth and root development. Had it for just under 11 days, Ornamental SweetCorn sprouting, Hibiscus & Lobilia seeds warming nicely and Cannas & Brugmansias plants thawing. Assembly required a little focus and a large flat surface, trying to assemble by balancing and multitasking a recipe for disaster. One longer side arrived damaged, contacted Support, lovely conversation regarding benefits of 6x Natural Fertilizer, replacement of damaged side a doddle. Not much else to say, a throughly enjoyable transaction. 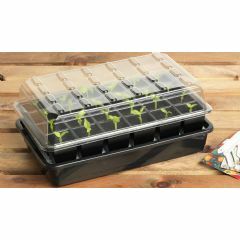 This is a large propagator and at a good price from this site. If I have one slight criticism it is that the join between the two sections of the lid could be stronger, they tend to bow slightly where it fits on top of the base. I bought the height extension so I can use it for cuttings. The thermostat is great and I should get lots of use from it. It arrived promptly and I was kept informed of despatch etc. Great product arrived promptly. Small issue with a cracked panel which was sorted by Greenfingers by return of post. Excellent company to deal with and the price was excellent too! Just got the electricity into the new greenhouse so running on all cylinders! 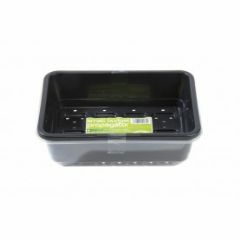 Build quality is top notch, is ideal for seedlings, cuttings and with the extra level helps growing plants on as well. Well worth the money! Bought it as Christmas present for my wife. I assembled it with no problems, and it worked fine. Seems very good quality, and should last a long time. This was bought for my husband who has retired it is much larger than other propagaters, plants will be able to stay until they are a good size making planting out less of a gamble. Strong well made product, seeds that normally take two to three weeks were showing signs of germination within seven days. this is great value, arrived quickly but some of the parts where wrong, they were very good and replaced them within 2 days, these were broken, once again they replaced them. Well designed and manufactured product at a reasonable cost. Could not fault the product, has been in use now for over a week and seeds are growing better that those in the greenhouse.